Bacon Blue Cheese Coleslaw, made with fresh cabbage, carrots, blue cheese crumbles, and crispy bacon, is the perfect salad for all of your summer cookouts. I’ve said before that I don’t like cabbage. I still don’t, really, but bacon and blue cheese make everything better. Much better, in fact. 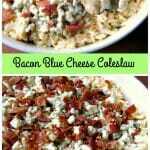 Trust me, I’m not going to be eating this Bacon Blue Cheese Coleslaw every day, but it’s great for special occasions like Memorial Day this coming Monday. I made this recipe after I was given a head of cabbage that I didn’t want to waste. You can buy two packages of coleslaw mix from the produce section, or chop/shred a large head of cabbage yourself. I find chopping much easier than trying to shred cabbage. Can you believe it’s almost summer?! I love it. If you noticed my absence last week, it was because I took the week off to go through all of our clothes (mine and Amanda’s) and bring out the summer clothes. Of course, now it’s 60 and raining. 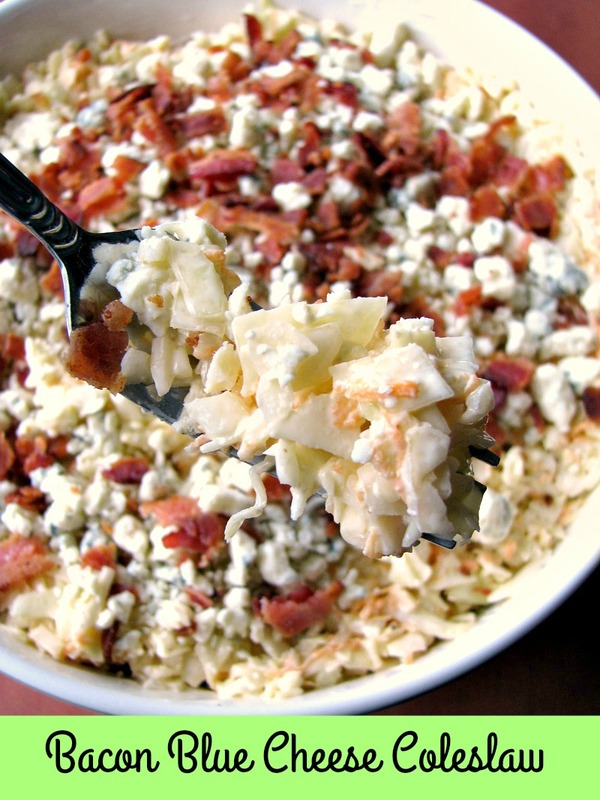 This Bacon Blue Cheese Coleslaw is tangy, salty, crispy, and creamy. I didn’t use a ton of mayonnaise, so it is only lightly creamy, but it can easily be adjusted to your tastes. You can add more bacon, less bacon (who would do that? ), adjust the blue cheese, make it creamier, and so on. I don’t know why I didn’t try this sooner! I didn’t invent putting bacon and blue cheese in coleslaw, I first heard of it years ago, but I never got around to actually doing it until the other day. I’m so glad I did! So, what are your plans for Memorial Day weekend? Are you going to or having a cookout? Creamy Cucumber Salad and Broccoli Cheddar Pasta Salad are always cookout favorites, and Grilled Cajun Blueberry BBQ Ribs are great for a group of people or just the family. Bacon Blue Cheese Cole Slaw, made with fresh cabbage, carrots, blue cheese crumbles, and crispy bacon, is the perfect salad for all of your summer cookouts. Combine the shredded cabbage and carrot in a large bowl. In another bowl combine the mayonnaise, apple cider vinegar, sugar, salt, and pepper; stir until well mixed. Pour the mixture over the combined cabbage and carrot; mix well. 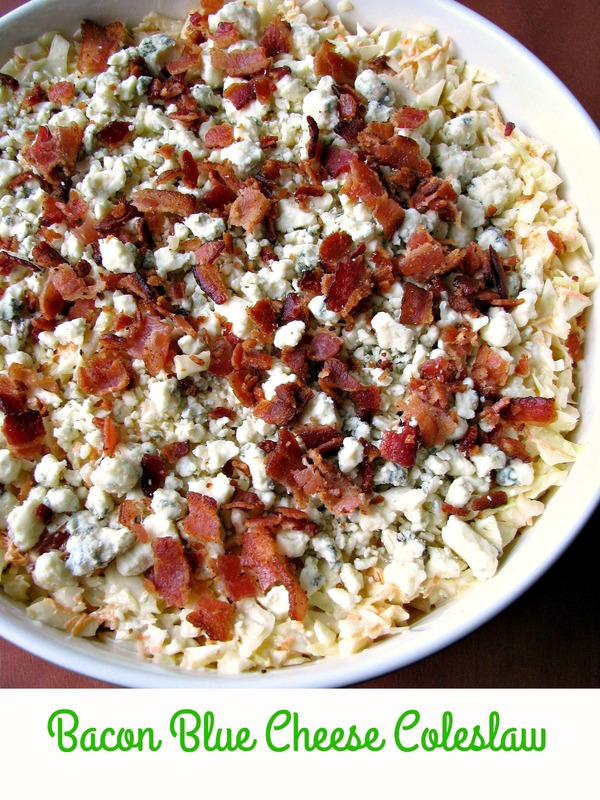 Fold in half of the crumbled bacon and half of the blue cheese. 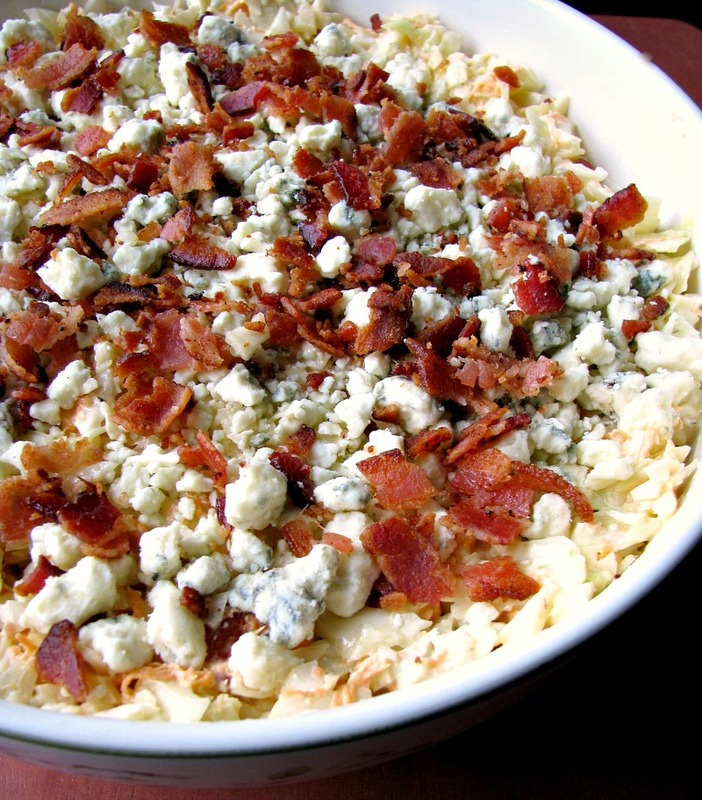 Spoon the combined coleslaw into a large serving bowl and top with the remaining bacon and blue cheese. Cover and refrigerate for at least two hours before serving. Total time reflects refrigeration time before serving.